In pregnancy, AKI occurs with a bimodal distribution. A peak in early pregnancy is associated with infection, particularly septic abortion, whereas a third-trimester peak is associated with late obstetric complications such as preeclampsia, abruptio placenta, post-partum hemorrhage, amniotic fluid embolism, and retained dead fetus., Renal dysfunction in the form of AKI and/or proteinuria can be seen in up to 7%–10% cases of PIH in varying degrees of severity. While complete renal recovery takes place in the majority of cases, some cases may culminate in persistent renal failure and end-stage renal disease. We present our experience with 347 patients with preeclampsia-eclampsia. In this prospective observational study, 347 pregnant patients with a diagnosis of PIH were admitted to our institution from 2010 to 2014. The M. S. Ramaiah Hospital, attached to M. S Ramaiah Medical College, is a major tertiary care referral center, catering to patient population from North Bengaluru, State of Karnataka and adjacent states. Records were analyzed for demographic characteristics, obstetric history, and clinical profile on admission. Obstetric history included parity, history of antenatal follow-up, location, nature of delivery, pregnancy, and maternal and fetal outcomes. Patients with preexisting diabetes mellitus, hypertension, chronic kidney disease defined as serum creatinine (SCr) > 1.5 mg/dL or presence of proteinuria >1+ on dipstick or renal transplant recipients, and presence of contracted kidneys on ultrasound were excluded from analysis. AKI was defined as SCr level >1.3 mg/dL. Preeclampsia was defined as blood pressure reading >140/90 mm Hg diagnosed for the first time after 20 weeks of gestation with 2+ proteinuria on dipstick. Severe preeclampsia was defined as the association of severe arterial hypertension (systolic arterial pressure exceeding 160 mm Hg and diastolic arterial pressure exceeding 110 mm Hg) or proteinuria >5 g/L or >3+ or signs of visceral involvement (headaches, visual disturbances, and epigastric or right upper-quadrant pain). Eclampsia was defined as the presence of new-onset grandmal seizures in a woman with preeclampsia. The HELLP syndrome was defined by the combination of thrombocytopenia (<100 cells/L), elevated liver enzymes (aspartate amino-transferase >70 IU/L), and hemolysis. Sepsis was defined as per criteria laid down by American College of Chest Physicians. Post-partum hemorrhage was defined as a blood loss of >500 mL after vaginal delivery or ≥1000 mL after cesarean delivery, or as noted in the medical record by a care provider. Patient outcomes were noted for mortality, and renal outcomes were defined as recovery of renal function or requirement of renal replacement therapy (RRT), as well as presence or absence of proteinuria. Renal recovery was defined as a decline in SCr to ≤1.0 mg/dL and presence of 24 h urine protein of <150 mg within six weeks of diagnosis of AKI. Patients who did not satisfy the criteria for renal recovery were subjected to a renal biopsy. The biopsy sample was analyzed for light microscopy (H and E stain) and immunofluorescence to stain for immunoglobulin IgG, A, and M as well as complement factors C3 and C1q and kappa and lambda light chains. Pregnancy outcomes (preterm, term, miscarriages, and abortions) were also noted. Data were analyzed using Statistical Package for the Social Sciences (SPSS) software version 18.0 (SPSS Inc, Chicago, IL, USA). Chi-square test was used to find the factors associated with the outcome. Statistical significance was tested at P <0.05. Risk estimate was calculated, and its 95% confidence interval was analyzed. Results are given as number, mean, median, and interquartile range for quantitative variables and percentages for nominal variables. Three hundred and forty-seven patients satisfied the criteria for PIH with an overall incidence of 3.4% among all pregnancies. Severe preeclampsia as defined by blood pressure parameters was seen in 48 patients (14%) with systolic blood pressure >160 mm Hg, whereas 62 patients (18%) had high diastolic blood pressure >110 mm Hg. The HELLP syndrome was seen in 31 patients (9%). Median age of the patients and gestational age were 26 years and 36 weeks, respectively. Majority of the women were primiparous (54%). Pallor was noted in 247 patients (71%), whereas pedal edema was seen in 141 patients (40%). Sixty-eight patients (19%) presented with uterine bleeding, antepartum hemorrhage (APH), or postpartum hemorrhage (PPH). [Table 1] outlines the key epidemiologic features of this cohort. Table 1: Demographics of patients with pregnancy-induced hypertension (n = 347). Laboratory parameters were suggestive of AKI in 56 patients (16%). Oligo-anuria was seen in 42 patients (12%) and microscopic hematuria was seen in 32 patients (9%). 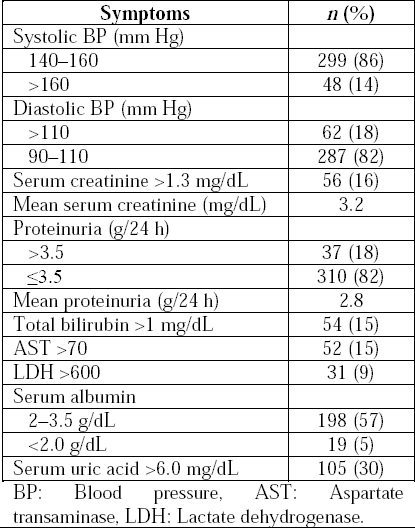 The mean 24 h proteinuria was 2.8 g. Other significant laboratory parameters pertaining to PIH are mentioned in [Table 2]. In the 56 patients with AKI, 19 (34% of AKI cohort) required RRT. Persistent renal failure, either in the form of elevated SCr or persistent proteinuria was seen in nine patients (2.5%). Patients with persistent proteinuria were found to have various glomerulonephritides, whereas the incidence of cortical necrosis in this cohort was 1.1% [Table 3]. In terms of other maternal outcomes, 164 patients (47%) required lower abdominal cesarean section. Fetal outcomes were characterized by 12 intrauterine deaths (3.4%). Maternal mortality was 2.5% (9 patients), of which majority was attributable to sepsis. 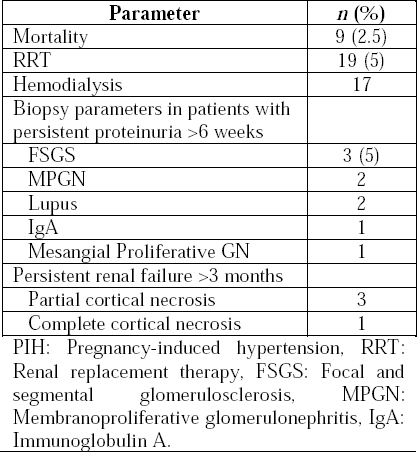 Table 3: Patient and renal outcomes of pregnancy-induced hypertension (n = 347). [Table 4] outlines the prevalence of risk factors for PIH in our cohort. Primiparity was identified as the biggest risk factor in our series. 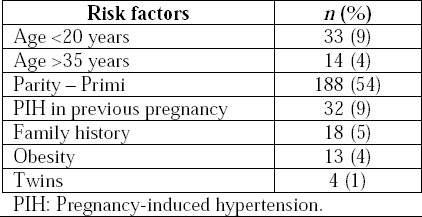 Table 4: Prevalence of risk factors for pregnancy-induced hypertension in the study cohort. Preeclampsia is a clinical syndrome that embraces a wide spectrum of signs and symptoms, either singly or in combination. Elevated blood pressure is the most important sign for the diagnosis of the disease. However, recent evidence suggests that in some patients, the disease may manifest itself in the form of either capillary leak (edema and proteinuria) or a spectrum of abnormal hemostasis with multiple organ dysfunction. Severity of the preeclampsia depends on the blood pressure measurements. However, other important features such as edema, proteinuria, epigastric pain, and neurological symptoms should also be taken into consideration. The diagnosis of severe preeclampsia based only on dipstick measurements in urine sample (>3+) is not adequate. In our series, we noted a low prevalence of preeclampsia-eclampsia in our cohort. This low rate can be explained by exclusion from our study of certain high-risk populations such as patients with preexisting hypertension or chronic kidney disease. In a study involving 1802 patients, 5.8% had preeclampsia of which 8.5% had chronic hypertension., In the Third National Family Health Survey, it was published that 28.7% of women in their cohort of 124,385 women reported symptoms consistent with preeclampsia, a percentage much higher than reported elsewhere in literature for a mixed risk obstetric population. The reason for this discrepancy lies in their utilization of “symptoms” to define preeclampsia rather than using strict definitions, which may have resulted in over-estimation of its prevalence. The prevalence of gestational hypertension ranges between 6%–17% in primiparous women and 2%–4% in multiparous women.,,, Gestational hypertension may often become chronic hypertension, and this may occur one or two decades before it manifests. Walters and Walters studied the pattern of normalization of hypertension in gestational hypertension. These patients recover from hypertension faster than patients with preeclampsia. The rate is substantially higher in women with twin gestation (14%), and in those with previous preeclampsia., Similar risk factors for preeclampsia were identified in their case–control study of 200 obstetric patients from South India. Approximately one-third of our cohort with AKI and 5% of the overall cohort required RRT, consistent with reports by Prakash et al and Drakeley et al who reported short-term RRT requirement in 4% and 10% of their cohort with preeclampsia, respectively., While majority of the patients showed complete recovery of renal function, cortical necrosis was noted in 1% of the overall cohort, again consistent with the declining trend of cortical necrosis. AKI in pregnancy is associated with a high risk for maternal mortality (9%–55%). Maternal mortality secondary to preeclampsia or HELLP is reportedly low ranging from 0% to 5.5%.,, However, perinatal mortality continues to be high in literature (37%–38%)., In our case, maternal mortality was low and was mostly related to sepsis. PIH remains an important cause of maternal morbidity and mortality. Identification of high-risk population, close follow-up, and an integrated management between obstetricians and nephrologists are important for improving maternal and fetal outcomes. Aggarwal RS, Mishra VV, Jasani AF, Gumber M. Acute renal failure in pregnancy: Our experience. Saudi J Kidney Dis Transpl 2014; 25:450-5. ACOG Committee on Practice Bulletins – Obstetrics. ACOG practice bulletin. diagnosis and management of preeclampsia and eclampsia. Number 33, January 2002. Obstet Gynecol 2002;99:159-67. Audibert F, Friedman SA, Frangieh AY, Sibai BM. Clinical utility of strict diagnostic criteria for the HELLP (hemolysis, elevated liver enzymes, and low platelets) syndrome. Am J Obstet Gynecol 1996;175:460-4. Killam AP, Dillard SH, Patton RC, Pederson PR. Pregnancy-induced hypertension complicated by acute liver disease and disseminated intravascular coagulation. Five case reports. Am J Obstet Gynecol 1975;123:823-8. Sibai BM, Ramadan MK, Usta I, Salama M, Mercer BM, Friedman SA. Maternal morbidity and mortality in 442 pregnancies with hemolysis, elevated liver enzymes, and low platelets (HELLP syndrome). Am J Obstet Gynecol 1993;169:1000-6. Goplani KR, Shah PR, Gera DN, et al. Pregnancy-related acute renal failure: A single-center experience. Indian J Nephrol 2008;18: 17-21. Prakash J, Tripathi K, Malhotra V, Kumar O, Srivastava PK. Acute renal failure in Eastern India. Nephrol Dial Transplant 1995;10:2009-12. Levy MM, Fink MP, Marshall JC, et al. 2001 SCCM/ESICM/ACCP/ATS/SIS international sepsis definitions conference. Crit Care Med 2003;31:1250-6. Prakash J. The kidney in pregnancy: A journey of three decades. Indian J Nephrol 2012;22: 159-67. Prakash J, Pandey LK, Singh AK, Kar B. Hypertension in pregnancy: Hospital based study. J Assoc Physicians India 2006;54:273-8. Agrawal S, Walia GK. Prevalence and Risk Factors for Symptoms Suggestive of Preeclampsia in Indian Women. J Womens Health Issues Care 2014;3:6. Ferrazzani S. Hypertension in pregnancy. Saudi J Kidney Dis Transpl 1999;10:298-312. Hauth JC, Ewell MG, Levine RJ, et al. 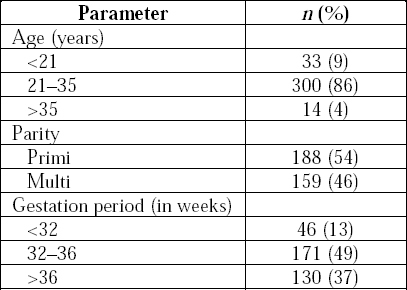 Pregnancy outcomes in healthy nulliparas who developed hypertension. Calcium for preeclampsia prevention study group. Obstet Gynecol 2000;95:24-8. Meyer NL, Mercer BM, Friedman SA, Sibai BM. Urinary dipstick protein: A poor predictor of absent or severe proteinuria. Am J Obstet Gynecol 1994;170:137-41. Knuist M, Bonsel GJ, Zondervan HA, Treffers PE. Risk factors for preeclampsia in nulliparous women in distinct ethnic groups: A prospective cohort study. Obstet Gynecol 1998;92:174-8. Buchbinder A, Sibai BM, Caritis S, et al. Adverse perinatal outcomes are significantly higher in severe gestational hypertension than in mild preeclampsia. Am J Obstet Gynecol 2002;186:66-71. Hnat MD, Sibai BM, Caritis S, et al. Perinatal outcome in women with recurrent preeclampsia compared with women who develop preeclampsia as nulliparas. Am J Obstet Gynecol 2002;186:422-6. Sibai BM, Hauth J, Caritis S, et al. Hypertensive disorders in twin versus singleton gestations. National Institute of Child Health and Human Development Network of Maternal-Fetal Medicine Units. Am J Obstet Gynecol 2000; 182:938-42. Walters BN, Walters T. Hypertension in the puerperium. Lancet 1987;2:330. Prakash J, Kumar H, Sinha DK, et al. Acute renal failure in pregnancy in a developing country: Twenty years of experience. Ren Fail 2006;28: 309-13. Yücesoy G, Ozkan S, Bodur H, et al. Maternal and perinatal outcome in pregnancies complicated with hypertensive disorder of pregnancy: A seven year experience of a tertiary care center. Arch Gynecol Obstet 2005;273:43-9. Ferrazzani S, De Carolis S, Pomini F, Testa AC, Mastromarino C, Caruso A. The duration of hypertension in the puerperium of preeclamptic women: Relationship with renal impairment and week of delivery. Am J Obstet Gynecol 1994;171:506-12. Nisescrt S, Dribusch E, Bellmann O, Kauhausen H. Disorders of liver function, thrombopenia and hemodialysis in a special clinical form of hypertension in pregnancy (the so-called HELLP syndrome) [Article in German]. Geburtshilfe Frauenheilkd 1988; 48(9):637-40. Pahwa N, Bharani R, Kumar R. Post-partum acute kidney injury. Saudi J Kidney Dis Transpl 2014;25:1244-7. Silva Júnior GB, Daher Ede F, Mota RM, Menezes FA. Risk factors for death among critically ill patients with acute renal failure. Sao Paulo Med J 2006;124:257-63.